Racing for the first time under the name of Leonard Green, Mo' Green rallied three wide to take the lead at the head of the stretch and then pulled clear to win Sunday's Grade 3 Top Flight Invitational by 3 1/2 lengths under Irad Ortiz. The 4-year-old daughter of Uncle Mo, now under the stewardship of trainer John Servis, covered nine furlongs over Aqueduct's fast main track in 1:51.79. Mo' Green broke exceptionally quickly, and had beaten the other four fillies and mares in the field by a half-length approaching the clubhouse turn. Ortiz chose to ease her back off the lead as Verve's Tale rushed up the rail to take charge, closely attended by race favorite Isabelle. In that first turn, Isabelle lugged out rather severely for several strides, forcing Mo' Green into nearly the five path around the first part of that turn. Isabelle got straightened out, then moved up to take over from Verve's Tale by a neck to mark the first quarter in 24.47 seconds. Ortiz was able to keep Mo' Green in the clear, a length behind the leading pair down the backstretch and tracking fractions of :48.98 and 1:13.60. Approaching the far turn, Verve's Tale began to apply pressure once again to the leading Isabelle, and Mo' Green moved up three wide to sandwich Isabelle between two strong rallies at the head of the lane. Turning for home, Mo' Green had the momentum and easily rolled away from her rivals, continuing to draw away down the stretch to cross the wire 3 1/2 lengths in front. Verve's Tale fought on for second, but was no match for the winner in her second start off the layoff. Longshot Oasis at Midnight got up to be third, and Winter just nosed out Isabelle for fourth. Bred in Kentucky by Candy Meadows LLC and Jim R. Wells, Mo' Green was a $40,000 Keeneland September yearling purchase. 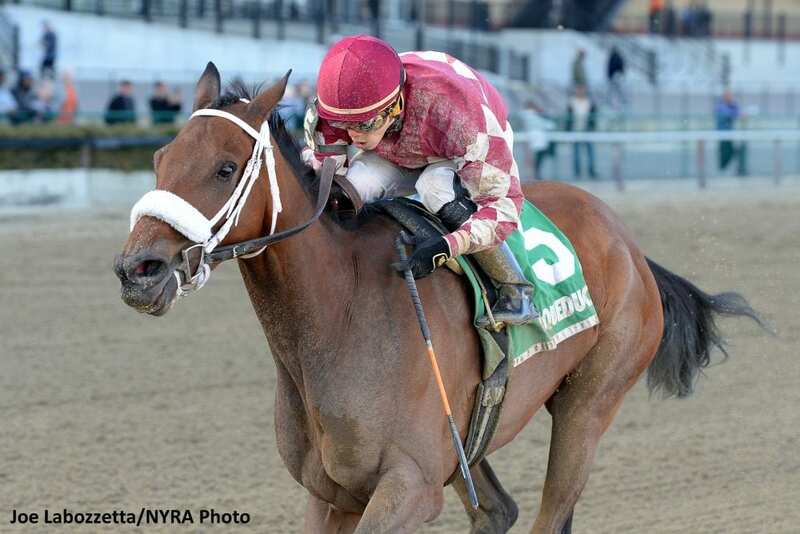 Pinhooked through the OBS April sale, she brought $70,000 from D.J. Stable, for whom she'd run all 10 of her career starts prior to the Top Flight. Mo' Green won a pair of allowance races for then-trainer Joseph Orseno, and ran second in the Feb. 18 G2 Royal Delta at Gulfstream. Overall, Mo' Green now boasts four wins and three seconds from 11 starts, with earnings of over $250,000. This entry was posted in Racing and tagged aqueduct, Irad Ortiz, john servis, mo' green, top flight invitational, Uncle Mo, verve's tale by Paulick Report Staff. Bookmark the permalink.